Earlier this week my friend Sara Camp Arnold passed along this Medium article written by the folks at Robicelli's regarding recent press on the bursting of "the cupcake bubble." She directed me specifically to item #7, a response to Jezebel's claim that "cupcakes represent prescribed modes of femininity and our cultural fixation on eternal girlhood." For now I'm not going to get into what I think about that (it's complicated), but the Robicelli's response hit home. They argue that while lady chefs are common these days, lady chef business owners are not. When the cupcake trend hit in the late 90s, numerous women saw it as an entrepreneurial opportunity. Many opened businesses out of their homes and hired a mostly female staff, catering to a mostly female clientele. This all rings a bell. The idea of women's creative domesticity as an empowering force for entrepreneurship, social capital, and community engagement is a theme I wrote about in my folklore Master's thesis at UNC, where I studied Vimala Rajendran's transition from community dinner home cook to chef and restaurant owner. Running a food business out of a home kitchen is something I've also dabbled in myself--first with Tarts by Tarts and now with Nothing-in-the-House Baking Co. This endeavor has allowed me and others like me to explore my interest in small business, develop my own baking skills, and make connections--creative, social, and entrepreneurial-- in my community. Now that doesn't sound anti-feminist to me. This pie was one that was a special ordered from Nothing-in-the-House by my friend Martha. She had cousins coming to town and wanted to show off some local flavor, so requested a "Baltimore Bomb Pie". The recipe was developed by Dangerously Delicious Pies, and is essentially a chess pie with Berger Cookies embedded in the filling. 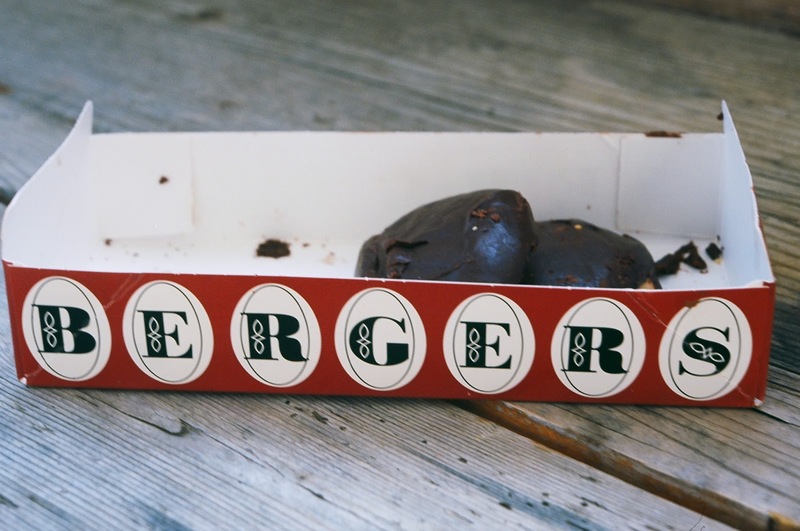 Never had a Berger Cookie? That probably means you just haven't spent much time in Baltimore, where they're a cultural icon. The rich, generously fudge-topped cakey shortbread cookie is of German origin and was brought to the Baltimore area by George and Henry Berger in 1835. The cookies are now baked by DeBaufre Bakeries and have only recently made it out of Baltimore's city limits--I found mine just outside DC at the Silver Spring Giant, but here's a list of other places where they're sold. 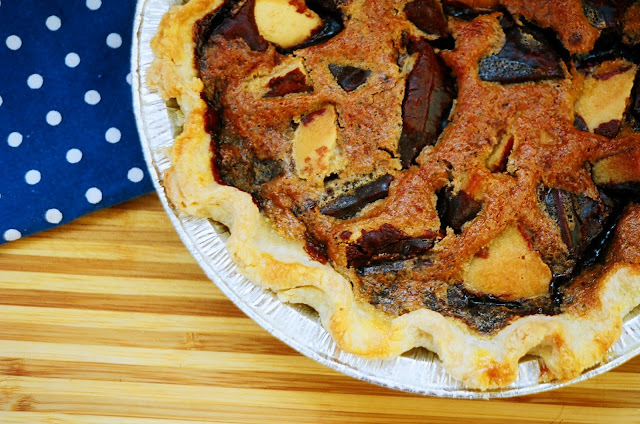 While the cookies are decadent enough, the pie only makes them more so, the 5 eggs and stick of butter really taking it to a whole. nother. level. I imagine that's the reason for the explosive title. Considering my generally pacifist beliefs and especially in light of current events, though, that name doesn't sit too well with me. Instead, I think I'll call mine a Berger Cookie Pie. Even by a different name, it'll still taste as sweet. 1. Prepare half of the Nothing-in-the-House pie crust as per the directions, retaining extra egg for an egg wash. Chill dough at least 1 hour before rolling out and fitting into a greased and floured 9-inch pie pan. Place the pan in the fridge while you prepare the filling. 2. Preheat oven to 350 degrees F. Place the quartered cookies in the pie crust. In a medium bowl, whisk together sugar, brown sugar, and flour. Beat in the eggs one at a time and add the butter, stirring constantly. Pour this mixture over the cookies. 3. Brush the edges of the crust with egg wash and bake for 45-55 minutes until the center is golden brown and the top is mostly solid (it should still jiggle a little). Let cool and enjoy! Labels: Baltimore Bomb Pie, Berger Cookie Pie, Chess pie, Maryland, Washington D.C.
My name is Ariel S. Winter, and I'm the creator of the Baltimore Bomb Pie. I worked at Dangerously Delicious Pies in Baltimore at the old location on Light Street in Federal Hill from about August 2007-February 2008. 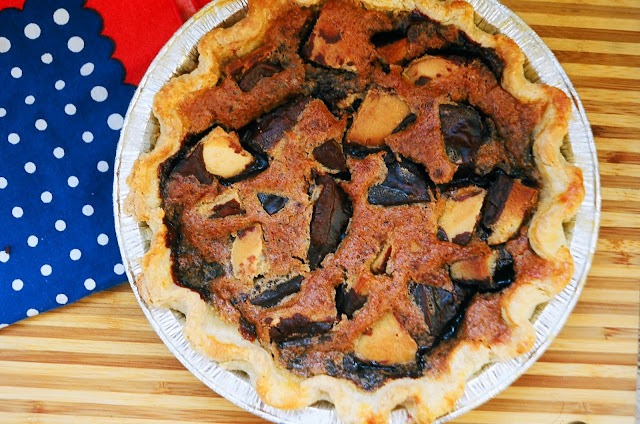 Anyone from Baltimore knows Berger Cookies, and since we were THE Baltimore pie shop, I thought we had to have a Berger cookie pie. Rodney Henry, the rock n' rollin' founder of DDP, was skeptical at first. He claimed he didn't like Berger cookies, but he gave me his blessing. So I hit the cookbook shelves in our apartment, and looked for a pie to adapt. 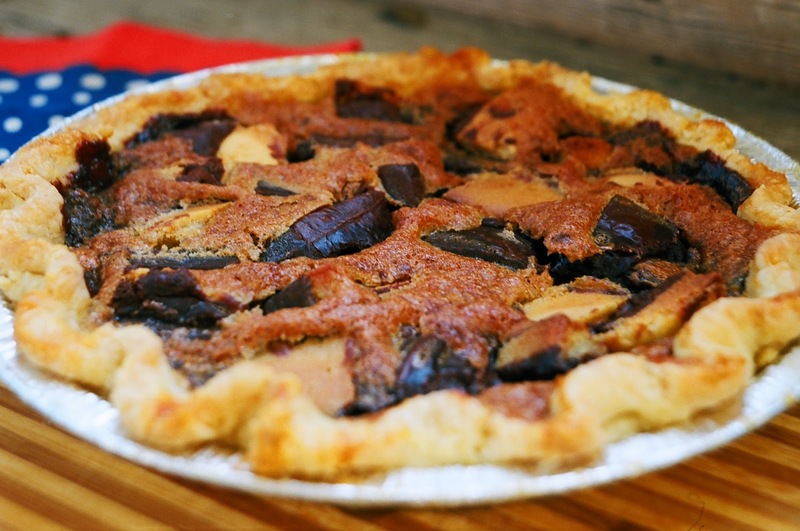 I settled on a classic chess pie--I don't remember which book it came from--and I added the cookies. That, of course, messed with the cooking time, and I think I adjusted the sugar slightly too. After baking a few gloopy failures, I brought the recipe into the pie shop. At home, I'd been making a single pie at a time. Rodney said that I could just go ahead and multiply the recipe by ten, so I whipped up ten Berger Cookie Pies (my oh-so-imaginative working title). When Rodney tasted it, he loved it so much that he decided to take that first batch with him to a car show where he was going to be selling pies. He didn't want to call them Berger Cookie Pies, because he wanted to put the DDP stamp on it, but he figured he'd come up with something. At the car show, three different people tasted the pie and had the same reaction, "That's a f**kin' good pie." So when Rodney came back to the shop, That's a F**kin' Good Pie was the original behind-the-scenes name. How he came up with Baltimore Bomb, I don't know. A couple of weeks after introducing the pie to the shop, Rodney admitted that I had turned him back onto Berger cookies (outside of the pie). How could you not love Berger cookies? Very cool. Thanks for sharing your story, Ariel! I don't see a name attached to my photo. Please credit it. Thank you.